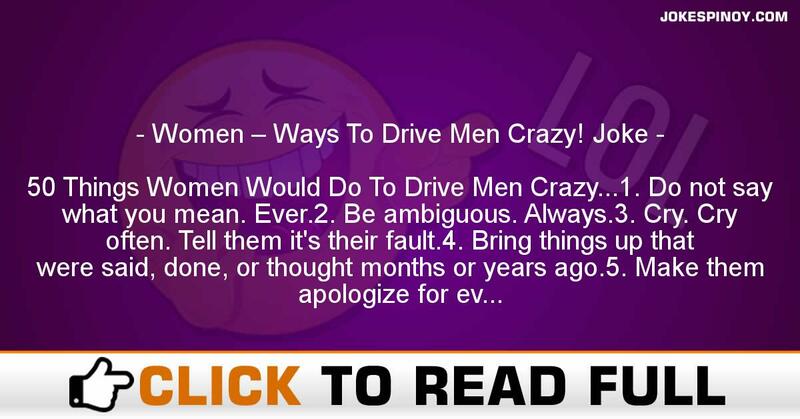 50 Things Women Would Do To Drive Men Crazy…1. Do not say what you mean. Ever.2. Be ambiguous. Always.3. Cry. Cry often. Tell them it’s their fault.4. Bring things up that were said, done, or thought months or years ago.5. Make them apologize for everything.6. Stash feminine products in their backpacks and in their books as cute reminders that you were thinking of them.7. Gossip. Gossip about everything that walks.8. Play Alanis Morissette’s “You Outta Know,” loud. Look at them Smile.9. Look them in the eye and start laughing.10. Cry.11. Get mad at them for everything.12. Discuss your period in front of them. Watch them squirm.13. Hold grudges.14. Demand to be e-mailed. Often. Whine when they don’t comply.15. When complimented, make sure to be paranoid. Take nothing at face value.16. Use daddy as a weapon. Tell them about his gun collection, his quick trigger finger, and his affection for his “little princess.”17. Be late for everything. Yell if they’re late.18. Talk about your ex-boyfriend 24-7. Compare and contrast.19. Go everywhere in groups, especially the bathroom. Do nothing alone. Independence is a sign of weakness.20. Cry.21. Make them guess what you want and then get mad when they’re wrong. 22. Plan little relationship anniversaries, i. e. the monthly anniversary of the time you saw each other in the library. . . for five minutes. Then get mad at them for forgetting. Then cry.23. Fall for your FAC.24. Gather many female friends and dance to “I Will Survive” while they are present. Sing all the words. Sing to them. Sing loud.25. Correct their grammar.26. Describe back-alley abortions. Then remind them of their mother or little sister.27. Constantly claim you’re fat. Ask them. Then cry, regardless of their answer.28. Leave out the good parts in stories.29. Make sure to only be interested in guys in the same friendship group. Make sure to cause trouble.30. Make them wonder. Confusion is a good thing.31. Cry.32. Declare that you are not wacko.33. Criticize the way they dress.34. Criticize the music they listen to.35. Criticize their hair.36. Ignore them. When asked, “What’s wrong?” tell them that if they don’t know, you’re not going to tell them.37. Try to change them.38. Try to mold them.39. Try to get them to dance.40. Pretend you’re interested, lead them on, then feign ignorance when confronted. 41. When they screw up, never let them forget it.42. Make them stay at religious services until they are close to fainting. Just because.43. Blame everything on PMS.44. Blame everything on PMS only after it has been blamed on them.45. Whenever there is silence ask them, “What are you thinking?”46. Get mad if they don’t notice a haircut. Even if it’s only a half inch.47. Read into everything.48. Over-analyze everything.49. Cry.50. Make it your goal to make THEM cry. ABOUT US : Laughter is the best medicine as the old saying says, we at JokesPinoy.com will supply you with all the funny filipino quotes and photos in tagalog language. Back in 2013, a group of Filipino OFW (Overseas Filipino Worker) got bored and they try to look for some humorous quotations on the net simply to have fun but unfortunately most of the websites they found on that time are having an old jokes and have no interaction with the users. From that instant, they subsequently got an idea to build their very own jokes website and let other users to give their jokes or comment together with the present jokes. After the funds and concepts collected, JokesPinoy.com was born, a website that let the user share their jokes and let them have conversation with other users as well. Since the website has been launching, a large number of visitors are coming each day to read jokes and have fun on the website and too as giving their view on the jokes they read. We hope from JokesPinoy.com that this website may provide you some grin and happiness, Life is Short so have fun on it. DISCLAIMER: Some of the jokes, photos and videos found in this site are not created by us, they are created by our users or they simply get it someplace in the net just like 9gag, youtube, metacafe, vimio and etc. We respect copyright information that is posted here including funny pictures and humorous videos. If encase there are files posted here in our site which is owned by your and you don't want to share it to anybody then fell free to contact us to remove it. Majority of the language used on this site was in tagalog and some are bisaya that are both filipino language which originated from Philippines, should you want to interpret the joke to english you can used an online translator to translate it from tagalog to english.